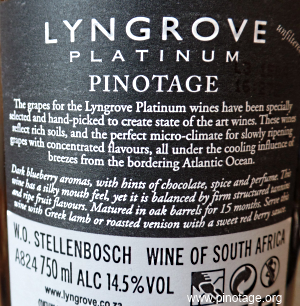 My Wine of The Month for April 2016 is Lyngrove Platinum Pinotage 2012. I've enjoyed some cracking wines from Lyngrove, but I regret the winery is below my radar. I've never visited them, something I must rectify on my next visit to the Cape. 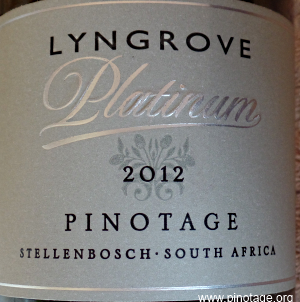 The 2012 was a Pinotage Top 10 Winner in 2013. The last time I tasted it was in 2014 and I think the wine now is even better and 'a point'. It has a lovely dark colour with a hint of cedarwood on the nose. In the mouth it is soft with integrated sweet fruit and a tangy finish. Fifteen months of aging in 40% new French oak barrels adds support without dominating. This is a beautiful elegant wine. Christian Eedes, at WineMag.co.za tasted two Pinotages from Neethlingshof with 30 years between them. The 2014 Owl Post Pinotage had 'lavender and incense, vanilla and spice before red and black fruit' with 'a marmalade quality' from Hungarian oak. See full review here. South African sparkling wine ... in Santa Cruz? Mary Orlin, of San Jose Mercury News, was keen to quiz Loma Prieta owner/winemaker Paul Kemp about his new sparkling wine and find out about "Kemp's pinotage obsession". "My favourite hands down was the pairing of the Pinotage and pumpkin," writes Nidha Narrandes of Johannesburg's Sunday World who visited Delheim Wines in Stellenbosch for a wine and cupcake pairing. Pinotage rosé with pomegranate cupcake. Pinotage with a Pumpkin & vanilla cupcake infused with star anise, cinnamon and nutmeg, topped with diced pickled pumpkin. 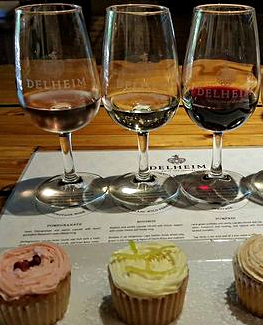 Gewurztraminer wine with the traditional African Makataan cupcake, festooned with makataan (wild melon) syrup icing. "The spicy pumpkin cupcake picked up every tone from the Pinotage and they waltzed together, an elegant taste. It is an amazing experience to try something unheard off and enjoy it that much", says Nidha.